Since my visit to Montreal, I’ve been left with a deep, deep hankering for pickles. Not just the commercial dills that you can buy at any supermarket, but the salty, pucker-inducing bite of a Jewish deli sour. While my husband preferred the half-sour to go with his smoked meat sandwich, I’m all about the full sour. Bring it on! So as I savored the last bite of the Schwartz’s Deli pickle that had made it’s way into my carry-on, I had an idea to try making my own. So this weekend I made pickles. While you might picture me slaving over a hot canning bath, I didn’t. With these pickles, fermentation rules instead of heat and vinegar. The best part? They only took me about 15 or 20 minutes to make. Talk about a quickle! I haven’t tried them yet (I feel they haven’t reached full sour capability), but the recipe I used is from David Lebovitz so I’m sure I won’t be steered wrong. Though, I’m afraid I did lean a bit too heavy on the pickling spices – let’s hope that won’t ruin them! UPDATE: So I finally tasted the pickles and while they taste good, the cut pickles were too soft. The pickles that I left whole were very crunchy and perfect. Perhaps the cut pickles should be eaten sooner and maybe only pickled for only 2-3 days instead of 5? If you’ve got any ideas, let me know! And if pickles aren’t to your liking, I’m a new contributor over at the popular design blog, Poppytalk and I’ve got a pretty tasty granola recipe up. Go take a peek and say hello! 1. In a large pot, heat the water with the salt until it dissolves. 2. Fill up your mason jars with boiling water and then dump the water into the sink. Alternatively, run them through the dishwasher if that’s what you got. 3. Tightly pack the pickles into jars. I left some pickles whole and others I quartered. Do what you like, just make sure that they are tight as you don’t want any pickles floating up above the brine line. Divide up the spices, garlic, bay leaves and dill amongst the jars. 4. 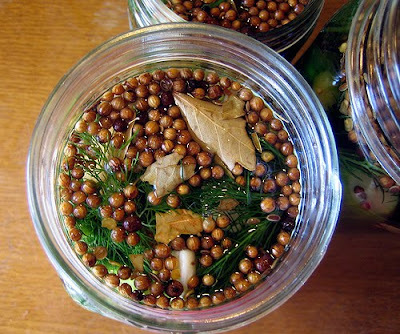 Fill up the jars with the brine, making sure that all pickles are submerged. Cover with cheesecloth secured with rubber bands and leave them in a cool, dark place for 3 days. Taste (they’d be more like half-sours here, I would imagine) or let them go for a full 5 or 6 days for a full sour. Once they are to your liking, store them in the fridge. They should last for a month or so. Your sour dill pickles sound great!! I have made quick pickles before using your "red hot cinnamon heart quick pickles" approach w/o the cinnamon heart candies as I had none on hand, and they turned out impressively good!! You must have eaten at Schwartz's Deli while in Montreal, right? If yes, I can totally understand your pickle fixation…mmm! Mmmm, I am going to try this!! I love pickles but canning seems so intimidating. I think, though, that maybe I can do it! Fun to have you with us Jeannette! I vote full sour too! Homemade pickles…perfect! I wasn't til I was in Montreal earlier this year….and went to Schwartz's [ smoked meat sandwich, fries, pickle and cherry cola ] that my love of pickles was reignited. I agree, that the other Canadian city I would consider moving to is Montreal. The Jean Talon market alone…. oh, i'm totally going to try this. thanks! Haha love the word quickle! I tend towards the less sour pickles. I used to only like the bread and butter ones. I love love love pickles. Every time I go to NYC I have to go to one of the big delis just so I can eat pickles to my heart's content. I have never made them myself and with all the great cucumbers at the markets, I think it's time to try. Thanks for a great recipe! mmmmmm big deli style pickles are my favorite! How fantastic!!! They look great! love the idea!! i shud try this way sometime sooner!! cheers! I just did a bit about pickling on our blog. We did green tomato chow-chow and sun pickles. Neither required cooking. Our son got wind of the activity and found a book that has recipes like yours (sans vinegar). Maybe we should book a group flight to Korea or Russia for pickled everything! Oh my will be so nice to eat these in a few months. You did so well. I love any kind of pickles. I get those cravings for pickles (the good ones) all the time in summer. Is it the salt or vinegar we crave? I love love love the photos. Look how brightly and sourly they sit there! Beautiful photos. I love pickles, too…all kinds. oh yes!! how i love pickles…! a friend of mine gave me a lovely homemade jar for my birthday a few years ago, it also had a slight curry taste to it– they were so good and garlicky and sour with that hint of curry…! Snaps to you for making your own pickles! That's such a happy picture of the jars full of cuke slices. 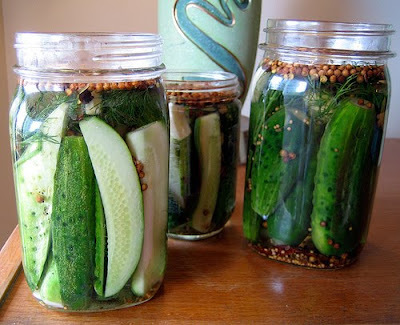 I haven't made pickles in years, but I love the idea of quick and easy. Great recipe, thanks for posting! I too love the super sour pickles, and have always thought I’d have to go to all the trouble of sterilizing the jars…this makes things so much easier. I’ll have to give them a try! Please let us know how they end up. Kudos for making pickles! I'm glad my fair city made such a lasting impression on you. Please visit again soon! Pickles have to be sour for me, and these sound great! Can't wait to hear how they taste. Emvandee, I'm sure they'd be fine canned with heat! try it. Ponderandstitch, try it, it's easier than you think. Thanks Jan, great to be posting on Poppytalk! Hag, damn, I never had the cherry cola!! Let me know how it goes Amelia. I like sweet ones too, eatme! Sounds awesome Don, I'll check 'em out! Helene, why wait? These are ready in just a couple of days. Kimberley, they were pretty good, but not as sour as I like my pickles to be! The cut ones were softer but the whole pickles remained very crisp. Curry pickles? Lyndsay, now I'm craving those! Aimee, I LOVED Montreal. You are very very lucky. Lisa, I'll edit these with my comments. Thumba, the whole pickles were very crunchy. The cut ones, not so much. i pickle veggies all the time, but everytime i try to pickle a cucumber (yes i'm using pickling cucumbers) they lack that "crunch" factor that i'm so longing for. did these come out??? Nice pictures and a good recipe, too. I think live-fermented pickles taste a lot better than cukes cured in vinegar and canned. For extra crunchiness, have you tried adding fresh grape leaves to your pickles? Supposedly they keep the cucumbers crisp, and so far it's worked for me. I have some from a big batch that have been in the fridge for at least a month now and they're still crunchy. are the peppercorns sprinkled on at the end before you put the cheesecloth on? They look yummy! Eric, I've heard that, though I don't know where I can find grape leaves! Stacey, the spices are added into the jars along with the pickles and then the brine is poured over top. I wanted to make sour dill pickle slices. Do you think the slices will be too mushy or soft with this recipe? Would fresh grape leaves make the slices crisp? And yes, I am a total novice…never had pickled anything! Dianna, I’m afraid that the slices might be too soft. I’ve heard that grape leaves do leave pickles crisper so you can try that. Or look for a recipe that is made for pickle slices. Good luck!! If it doesn’t work, try again! I know I’ll try again with a different recipe.